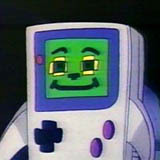 Gameboy was sent by King Charles to Videoland from the Mirror World. He is young and naive, but is quite gifted at games. He uses his display to create weapons. The portal that King Charles sent Gameboy through is a portal that appears only once each 1,000 years. Gameboy is resented at first by all of the N Team but Princess Lana although he is eventually accepted and liked by all.